This is theme three of a series of seven. We’ve developed these to help us decide on the future direction of the Mozilla brand, and now we want your thoughts as well. Protector seems to stand off. When you think of the protector of the internet I think of the Norton products. Great point, Rob. Mozilla is already sometimes confused as an anti-virus company (because our main product Firefox offers strong security and privacy) or a wi-fi provider (because we advocate for stretching Internet access to more people around the world). If we move forward with “The Protector,” we should be more clear about what we’re protecting. While I can certainly understand where Mozzila is trying to go here, I don’t like this as the central theme. I feel this would work better integrated into another theme, perhaps “For All.” As a stand alone theme, it does seem more like Mozilla is doing the work of the Internet Defense League or Fight for the Future. While Mozilla supports these groups, as evidenced by the Battle for the Net Website main page, Mozilla doesn’t stick to just that idea. You also make products and services. Thanks for that feedback on The Protector, Gene. While the policy and advocacy teams at Mozilla played a strong role helping to bring about net neutrality, you’re right that we also produce technologies that help form Internet standards and we put our philosophy into practice with Firefox and other products. Your thought about integrating some ideas from one theme into another will be our next step in this process. Thanks for being along on this journey with us. This is an aspect of who we are that is really important to me. I agree with Gene’s comment above that this is probably not the only thing we would want to emphasize (and the word “protector” could mean many things), but there is a general theme here that I like: the Internet is in trouble, and we are a force to help turn that around. In order to engage with people, they need to understand what’s wrong about the Internet today. I believe that’s the only way to engage people who would otherwise not care. (Themes around “for good”, “love”, etc are feel-good themes that won’t truly engage those who aren’t already deeply involved in the subject.) 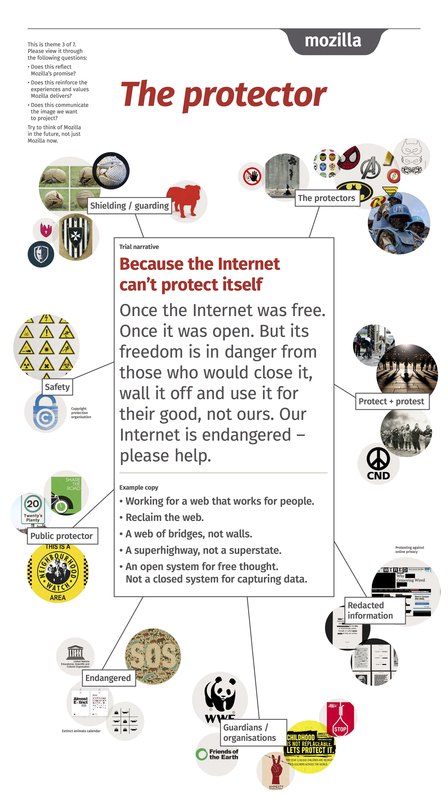 Normal human beings need to see why we’re fighting for the open web, and it needs to be explained in a way that makes sense. Then, Mozilla should be seen as a force of good in that fight. There’s a balance here between acting as a police against the “bad” and demonstrating though leadership and forward movement towards the “good”. 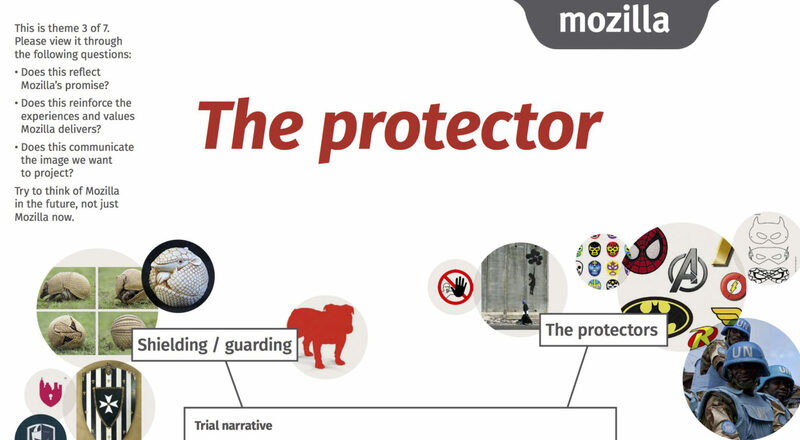 That’s why I think “The Protector” is a theme that is best combined with something that also brings the positive/future-facing aspects of what we do (products, services, solutions to real people). Exactly, agreed 100%. There needs to be a balance between the two. Great work so far with these themes! I wonder if rephrasing this as “Guard” helps? I’m thinking of Meerkat guards, for example. The one that’s not eating so that you can safely do that. Maybe also something that’s a community effort. Basically replacing Shield with Watch. Also probably something that’s tricky to port to many cultures, because of the subtle differences in wording, and because various pictures here have strong feelings based on local civic history. Since sharing these themes in London, we’ve considered rephrasing this as “The Guardian,” which would address your suggestion. Good point about finding not only universal words but a universal visual language to work globally. Since the image associated with a brand is the first thing the brain takes in, finding symbol(s) for Mozilla that are distinctive as well as cross-cultural will be a fun challenge. The Mozilla Meerkats brings a smile. An important message, but perhaps better as part of “For Freedom”? The Protector and For Freedom would be an interesting mashup. What elements might you sacrifice in the combination of these two? Which would you emphasize? This is another one that partially resonates with me. If you talk about Mozilla as my personal guardian, or the guardian of my family and my information, I love it. But if you get abstract with it, talking about guarding the freedom of the Web, it starts to lose its power over me. It becomes just a slogan instead of having personal meaning. We need to be sure we don’t become so abstract that we become meaningless to the average person. Many people are inherently self-motivated and want clear signals about what things mean. At times those same people have a capacity to involve themselves in something bigger even if it’s not entirely understood. This does not necessarily mean they’ll march in protest, but they might bring it up in conversation with a friend, sign an email petition, or take some other small action in good conscience toward what their gut is telling them is right. We need to keep it real for those people too. Thanks for reminding us. Reminds me on SOPA protests described in “The boy who could have changed the world”, where Aaron Swartz wrote about a girl talked to him, that “you know, we have to kill SOAP [sic!]”. Starting the narrative with “once” sounds nostalgic. “A superhighway, not a superstate” sounds very U.S.-American. Highways may not play any role in poor countries. Superstate sounds 1984. Who shall relate to that? To me the highlighting of an endangered web resonated the most. But I only learned to realise the issue after the Snowden leaks when reading more about the Internet background (including disputed persons like R.M.S.) and must-read novels like 1984 and V for Vendetta.